Given impetus after the September 11th attacks in New York in 2001, the technology of “colour revolutions” as an element of fourth generation warfare has become the primary method of hijacking the functions of a foreign sovereign State. This is partially due it being both economically cheaper and less risky than a military incursion, but also due to the truncated way in which people now communicate. In general, the interactions between people in cyberspace can be measured in the microseconds category, thus it is much more difficult for any event to escape a camera lens. The perfect example of this is the way in which footage of bombings in Syria, Iraq, Yemen etc is uploaded to video hosting websites such as YouTube literally within the same hour that they happened. This is in fact why the British businessman James Le Mesurier, the director of Mayday Rescue, was tasked by the architects of the Syrian war to create the “White Helmets“ – a NGO that would serve as a way to control the narrative being broadcasted from the scene of the latest airstrike either by the Syrian or Russian airforce. 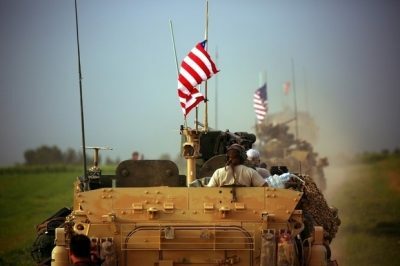 For Washington and allies it was absolutely imperative that during urban combat in cities like Aleppo, where civilians were being used as human shields by “moderate rebels” and Al-Qaeda in Syria, the Pentagon’s proxies were never shown in a bad light. Of course, in areas under the control of terrorists it was not possible for Damascus to send in ambulances and medical workers to help potential victims of bombings or shelling, and visa-versa – it wasn’t possible for medical workers terrorists to attend the scene of what was usually VBIED attacks in Assad-held areas. Thus, the status quo was the Syrian State media did its work in the government-controlled areas, and the West’s NGO network did its work in the jihadist-controlled areas. Of course, the work that reached the eyes and ears of European and American corporate news viewers wasn’t that of the former, for obvious reasons. This is perhaps why the “White Helmets” received an Oscar – as a “thank you” for their “wonderful” work in ensuring the scent doesn’t follow Uncle Sam back across the Atlantic. Whilst this mechanism worked efficiently for Washington et al during the most critical moments in the Syrian war, which, incidentally, cannot at all be described as “civil”, since the terrorists with weapons in their hands are 100% funded and armed by foreign States, the fact that it is unable to control every informational element of the conflict in the Levant highlights a key flaw in the “colour revolution”blueprint stored away on Capitol Hill. To illustrate this point, the reader should now watch the video from July 18th, 2017, below, in which the notorious Al-Qaeda Saudi-born cleric Abdullah al-Muhaysini – a key person in today’s jihadist movement in Bilad al-Sham, responsible for both recruitment and washing brains – is being interviewed by one of the key people in the West’s NGO circle Bilal Abdul Kareem. Before talking about the content of the video above, it is very important to immediately recall that Muhaysini – the main ideological component of Al-Qaeda in Syria – has his own YouTube channel (Google permits this) as well as social media pages (his Twitter account was eventually deleted, but not before acquiring over 50k followers; he subsequently created multiple other accounts). Throughout the entire Syrian war he has been regularly interviewed by “journalists”, and usually the information that comes from his mouth is very damaging to the narrative of the war broadcasted by the media of Western States. So, in the July 18th interview with Bilal Abdul Kareem he once again stated information that is contrary to what the US State Department expects observers to believe. To paraphrase, Muhaysini insists that not only is the so-called “Free Syrian Army” (FSA) not an organisation itself, but the name of an “umbrella” that covers many local formations, but also that the “FSA” sees eye-to-eye with the Mujahideen on core issues, primarily the extermination of the Shia. “there is no such thing as the FSA, only slogans”. Stockpiles of western-made weapons that were being stored in schools, libraries, medical facilities – anywhere with four walls, were being used by various al-Qaeda affiliated groups to attack the Western side of the city. One such discovered weapon – $50,000 per unit TOW missiles – could only have come from a US-“vetted” group like Nour al-Din al-Zenki, which is known for beheading a child and filming it in Aleppo, and which fought side-by-side with al-Nusra in the same city. Now factor in Syrian “rebel” commanders revealing probably too much when giving interviews to the press, and it really becomes difficult to prove that there is a single non-terrorist entity called the “FSA”. By using what Muhaysini said in this video in conjunction with things he said in other videos (for example), the entire NGO network created by the “civilised” western world starts to get its wires crossed, leading to self-strangulation. This is in fact what happened with the fraudulent “Bana” personage. She has now been completely exposed, but she already served her purpose (to hide the West’s footprints in East Aleppo) and became null and void the moment Aleppo was liberated and the West’s attempts to declare a no-fly zone failed. The crux of the matter is that the West knows from experience that propaganda and falsehoods have an expiration date, and thus there is a need for a reverse narrative, akin to following the same trail of footprints created when entering a forest in order to exit from it. However, as a result of what can only be described as sloppiness when implementing the “colour revolution” scenario in Syria, the green-white french-mandate flag used by the West to depict the imaginary “Syrian revolution” can today be seen flying over the heads of terrorist groups in Idlib – a city proven to be exclusively under al-Nusra control, and where the remnants of the “moderate rebels” that don’t opt to join Ahrar al-Sham (pro-Qatar and pro-Turkey) are being massacred by al-Nusra, above the heads of Turkish proxies in Northern Syria, which is precisely where they originate from, or above the heads of militants of the YPG/SDF, which now echo the Saudi wahhabist anti-Iran mantra whilst being used by the US as human shields to partition the country. All images in this article are from the author except for the featured image.